We continue our analysis of a published and affirmed Sober DUI and drug case, that is now precedent in the state of Kentucky. For the introduction, please go here. The chain of custody is a legal term that refers to the foundational requirement that an exhibit offered into evidence at a hearing or trial is in the same condition as it was when it was seized. By foundational requirement, I mean that a party offering an exhibit into evidence (e.g., a gun) must establish that the gun being offered into evidence is the gun that was seized and it is in the same condition as it was when it was seized. The purpose of the rule is to prevent evidence tampering. Judges and lawyers use the word “chain” because an exhibit typically passes through several hands between seizure and the courtroom. Each person who handles the exhibit is a link in the chain of custody. 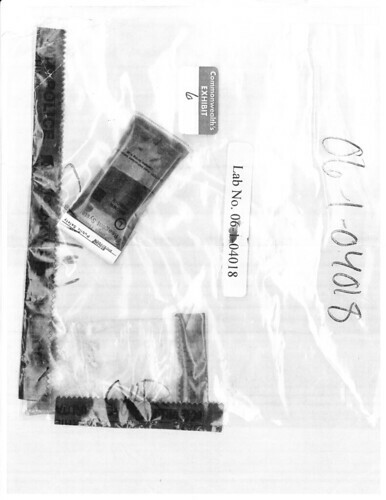 In the typical drug case, for example, an officer will seize a suspected controlled substance, weigh it and seal it in a bag with her initials across the seal. She will then fill out a drug-exhibit form listing the weight and describing the suspected controlled substance. She will take the exhibit to the police department’s evidence unit where it will be logged in briefly describing it and listing the date and time she presented it as well as her name and badge number. At some point later on, she will retrieve the exhibit from the property room, sign the log book acknowledging she received it and send it to the crime lab for testing. Cops often Fedex exhibits to the crime lab. 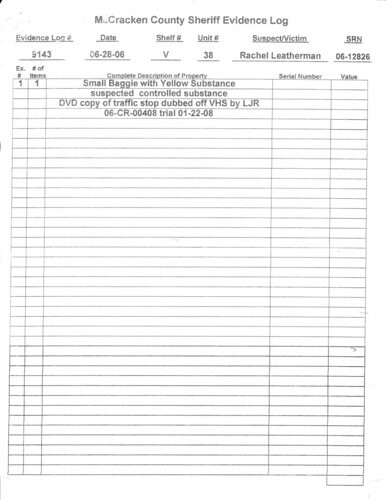 The crime lab also maintains a log book that will record when the exhibit was received and from whom it was received. The exhibit will be placed in the safe where it will remain until it is assigned to a lab technician to test. The tech will sign it out and take it to the bench where he will open the bag, examine and weigh the substance. He will take a small amount to test, weigh what is left of the exhibit, record the weight, replace it in the bag and reseal the bag signing and dating the bag across the seal. Then he will conduct the testing procedure, record the results, and return the exhibit to the safe. The return will be duly recorded in the log book. At some point, the exhibit will be logged out at the crime lab and returned to the police agency where it will be logged in to the evidence unit. It will remain there until trial when it will be released to the prosecuting attorney who will take it to court and offer it into evidence. All competent defense counsel request copies of all of the documents that make up the chain of custody to make certain that every transfer is documented, the descriptions of the exhibit match, and the weights agree. They also request the lab tech’s bench notes that detail what the lab tech did with the exhibit. If something is missing or out of order, defense counsel will object to the exhibit being admitted into evidence on the ground that the prosecution’s foundation is insufficient. Any defense attorney who does not do this is incompetent. One small baggie with yellow substance, suspected controlled substance. Next page, a uniform offense report. 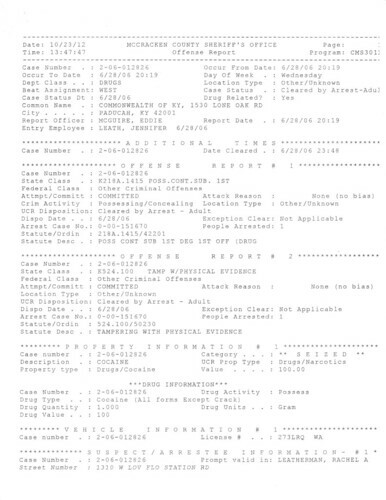 Note that there is no DUI listed, although the arresting deputy, Eddie McGuire, describes the “Sheriff’s Department” as the “Victim” and notes that the “Victim” is “under the influence of drugs.” The DUI, in fact, was added in the next day. You might note that the ‘asking to buy heroin’ was not related in the 911 call, or the dispatch recording, or in the caller’s written statement the next day. We will be uploading all of these documents as well as footage, in future posts. Also, I’ll upload the dash cam arrest video of the roadside stop and search, and you can decide for yourself if my pants are unbuttoned and unzipped. Notable, he says, “Officer fell in behind the vehicle and stopped it.” Remember the Court of Appeals? They concluded that I stopped the cop. That is because the deputy told a brand new and entirely different account at trial 18 months later, when his off memory had had a good deal of time to improve. You may note that the officer alludes to the idea that I lied about my orthopedic surgery, which was the result of a 30-foot fall, just two years prior. I’ll take care of that right now. 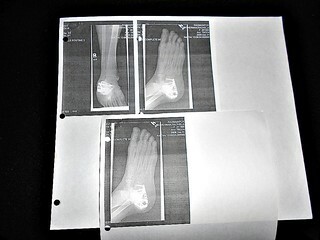 Here is the xray of internal fixation to my right calcaneus. This photo is not part of the chain of evidence, but it is significant, because at trial, the jury was told that I refused all sobriety testing, even though my blood was sent to at least two labs. Chemical tesding of the blood in Kentucky, is considered a refusal in my case, but not in the Kentucky statutes. Couple of significant things here. 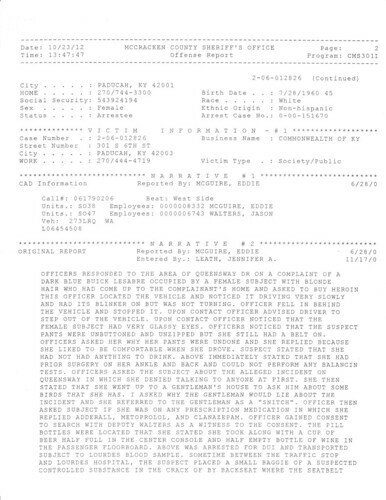 Note that he makes no mention of the DUI here. Also on the vacuuming. He testified in various hearings, that he vacuumed the day before, two days before, or the week before, or at Officer Terry Long’s house, or at the car wash, depending on the day and the version. He was never confronted on these inconsistencies by my trial lawyer, Department of Public Advocacy Director for Western Kentucky Chris McNeill, the most deceitful, worst lawyer in America. 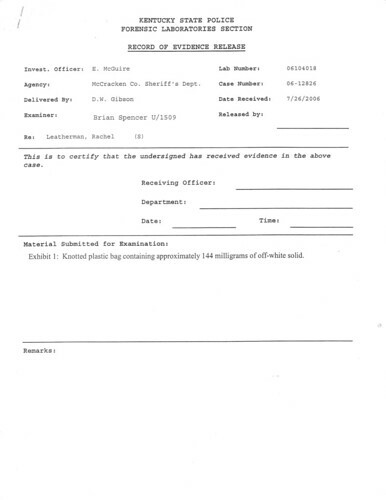 Next document, Kentucky State Police Request for Examination. 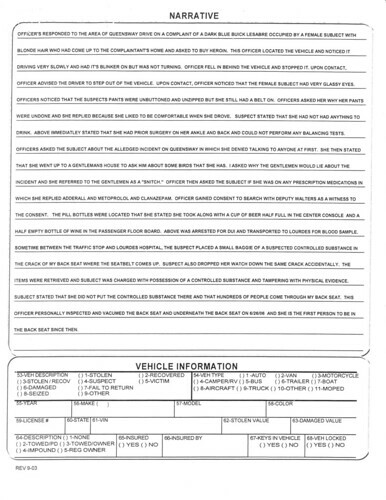 The next document is a typed sheet of paper that is not signed or filled out, nor is it an official form. 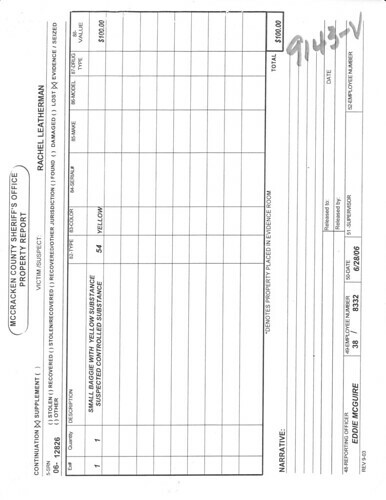 The Kentucky State Police lab forms are notable for their indication of the type of form, at the bottom right hand corner of the form. 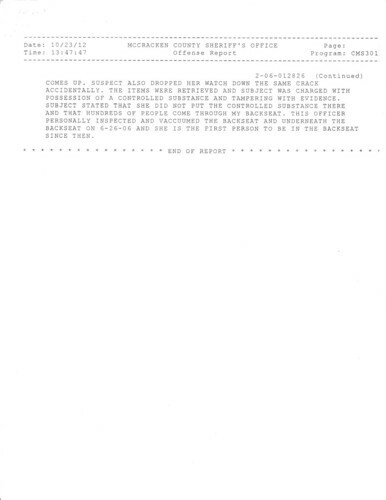 That is missing, from this typed sheet of paper. 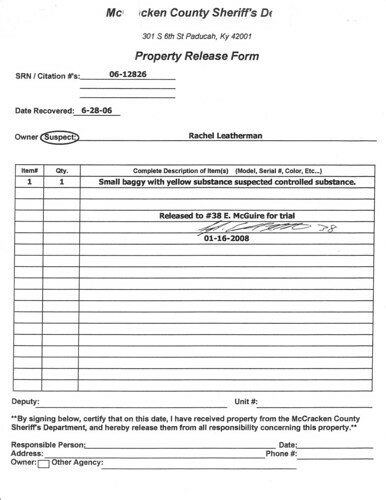 What is interesting is, it appears that a deputy DW Gibson, delivered the item to the lab, two days after it was sent, on 7/24. The item arrived on 7/26. That’s two days later. The lab that the item was sent to is in Madisonville, a little over an hour from here. Where it spent the two nights is unknown. Also, when it arrived at the lab, it had changed color, from yellow to off white, and more significant- It lost 86% of its weight. It weighed 1.000 Grams in Paducah. On arrival in Madisonville, it weighed 0.144 Grams. Also, now it is a solid, but in Paducah it was powder. 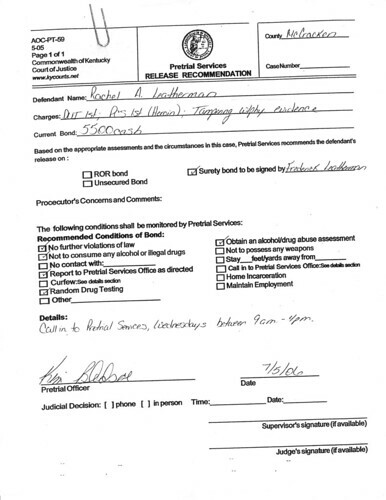 Plus, there is no signature whatsoever to indicate that the item was released from the lab, to return to Paducah. The typed sheet of paper is blank, for the most part. Released for trial- one full week before the trial, that included a weekend. Where was it? How much did it weigh? We have no idea. It could have been anywhere, including the officer’s back seat, his pocket, his refrigerator…We will return to the subject of January 16, in future posts, because as it turns out, that was a busy day. A busy busy day of photo-taking, emails back and forth, and phone calls. We will get to that. Curiously, in October of 2012, six years after my arrest, and after I had served time, the item was still available. 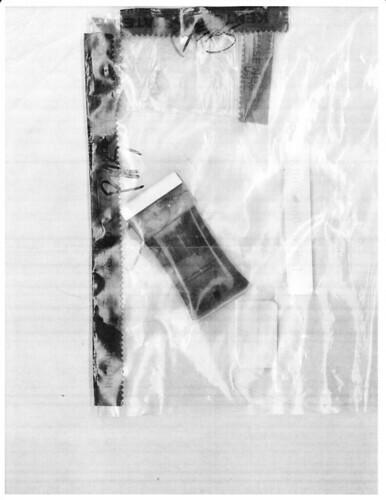 Oddly, the field test kit that was negative for heroin was also available, in the sealed bag, so I took photos at the Sheriff’s office. 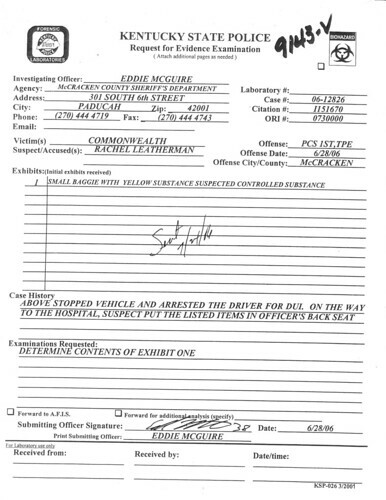 That is the chain of evidence, from the McCracken County Sheriff’s office, for the drug item in my case. Chris McNeill never requested the chain of evidence documents. You are currently browsing the archives for the Chain of evidence category.